I am a bit of an Alton Brown fan. When I saw the episode of Good Eats entitled Tamale Never Dies, I knew I had to try my hand at Tamales. I watched the episode a couple of times, read through the recipe and braced myself for the task. One issue I quickly faced was the quantity. The recipe says it makes 24 tamales (I actually ended up with a little over 30). That’s a lot of tamales. 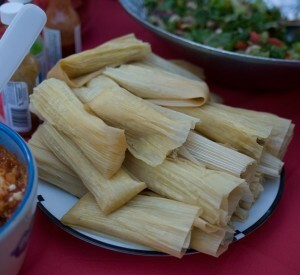 Fortunately we had our Fourth annual block party come up, so I seized that opportunity and offered to bring tamales. We found ourselves with the luxury of a night on the town when our church sponsored a parent’s night out. We could drop the boy off and hit the town. So we wanted to try out a new spot. 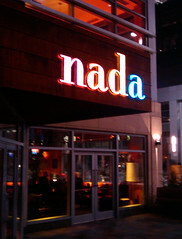 I had heard one of the local bloggers rave about Nada, and we like our Mexican, so we chose that for our night out.